Press "CTRL" + "-" to reduce. Press "CRTL" + "0" to reset size. 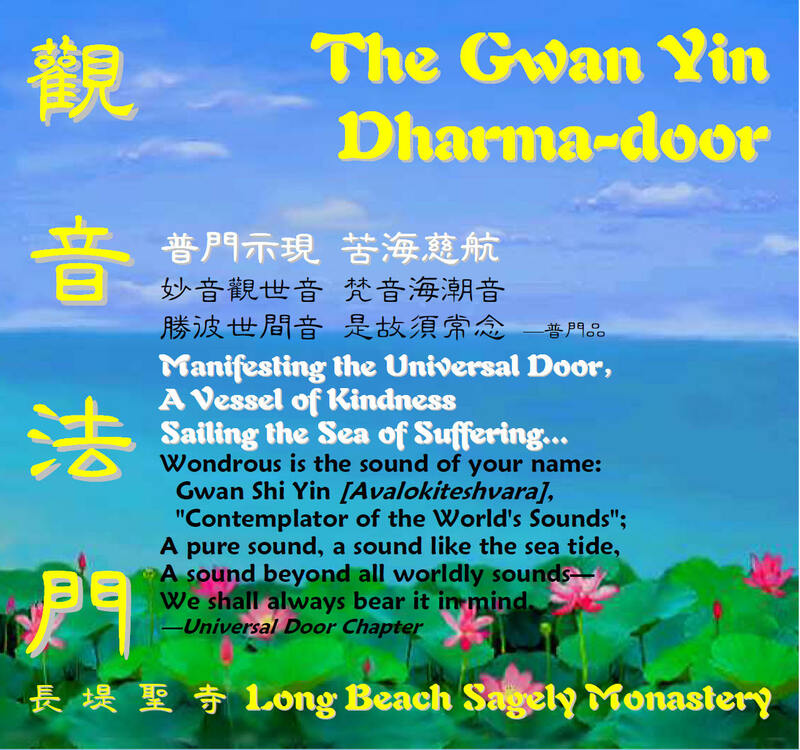 - Gwan Shr Yin [Contemplator of the Worlds' Sounds] [Avalokiteshvara] Bodhisattva spoke the Great Compassion Mantra so that "all sentient beings might have peace and happiness, be rid of all sicknesses...leave far behind all fears...have all their various wishes quickly fulfilled." 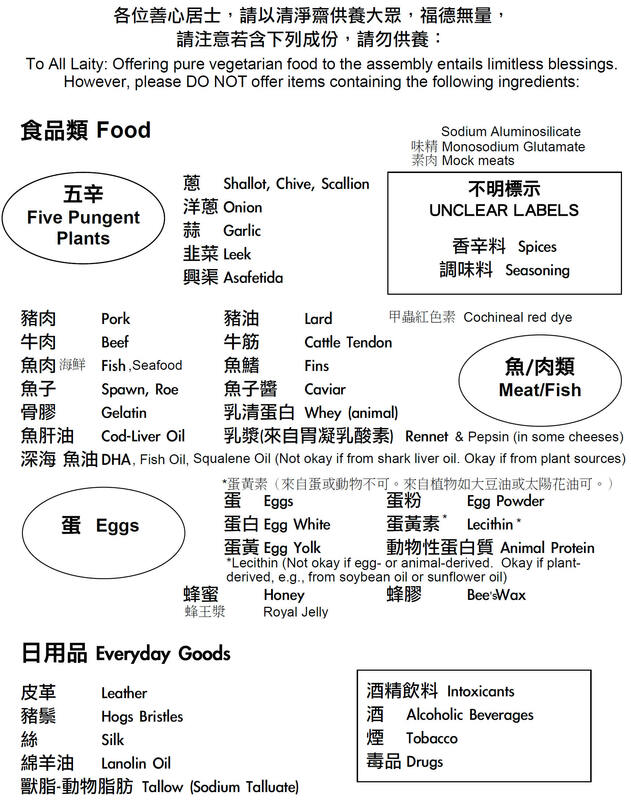 This first section is in English. 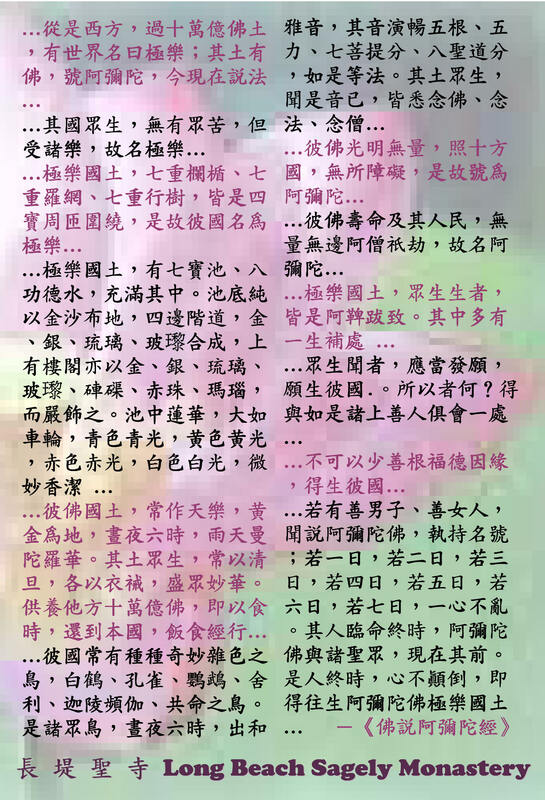 For Chinese, please scroll down to the next section. You may choose method 1 (Download > unzip > open with Flash Player, Shockwave, or a browser) or method 2 by following the audio file with the PDF file. 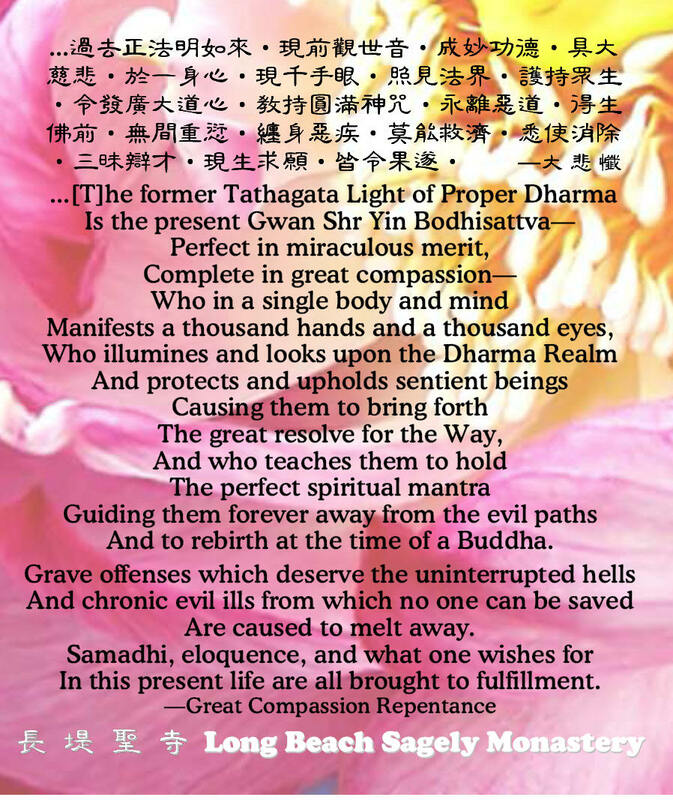 * The text of Great Compassion Repentance is published as a single copy and is also included in the CTTB Daily Recitation Handbook, both of which are available from your local branch monastery or online from www.bttsonline.org or www.fajye.com.tw. gained through practice ages long. is in the crescent of her brows. In a thousand hearts she answers. 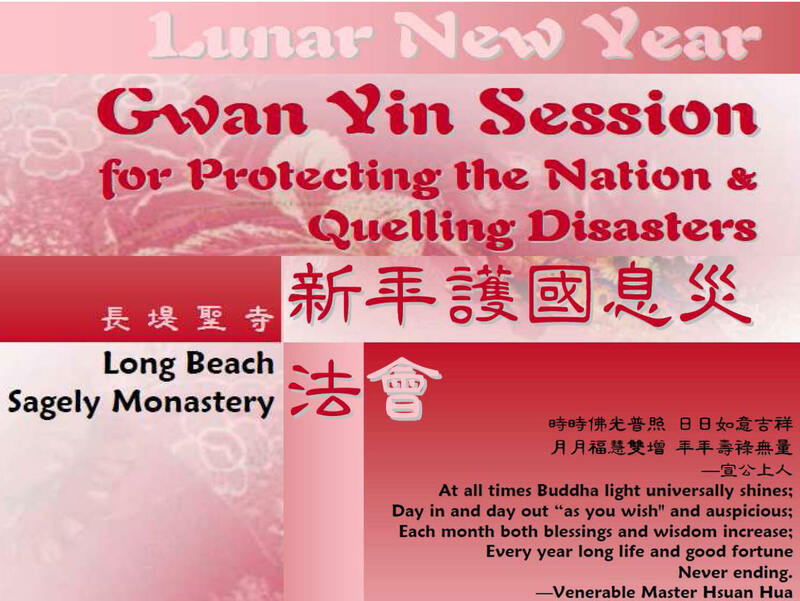 Vow to accomplish the Unsurpassed Wisdom. Offenses arise from the mind; repentance is by the mind. If the mid is extinguished, offenses are forgotten. The mind forgotten, offenses extinguished--both are empty. Have slandered and disrupted the Triple Jewel. 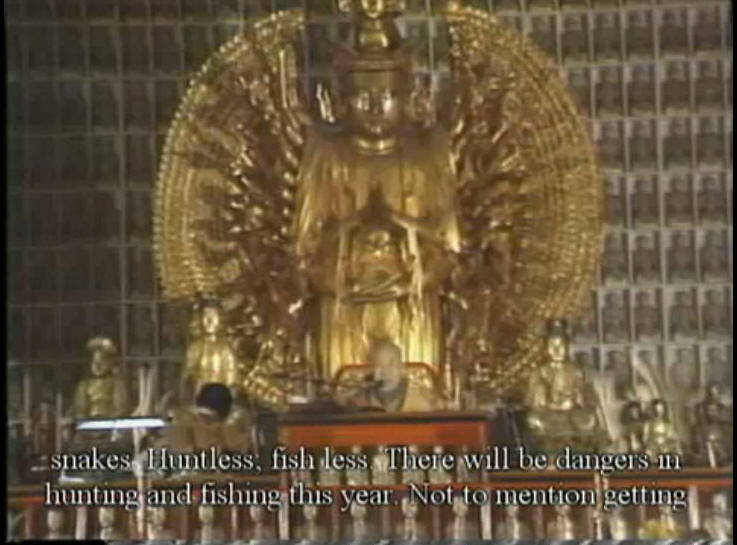 And shed the Buddhas' blood. And stolen the Sangha's* property. I have denied cause and effect. And furthermore, have gladly complied when I saw or heard them being done. Honestly and sincerely confessing them. I humbly seek to repent and reform. And the Three Obstacles* dispelled. 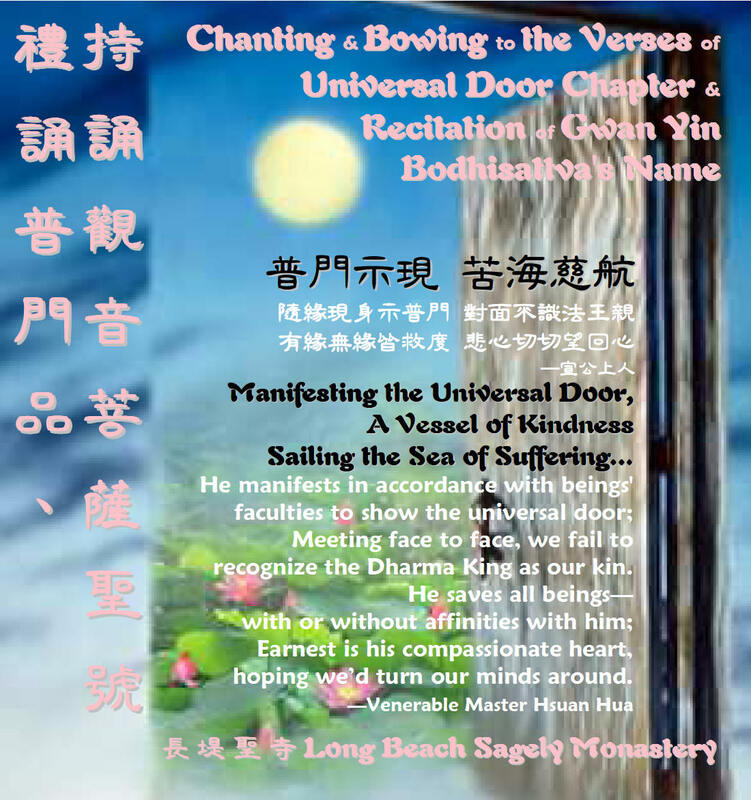 Namo Maha Universal Worthy King Bodhisattva Mahasattva [Homage to Universal Worthy King, Bodhisattva, Great Being]! Living beings are born without a beginning, and die without an end. Without beginning and without end, they transmigrate, revolving in birth and death. Living beings revolve and turn in this beginningless and endless transmigration like dust motes: suddenly up in the heavens, suddenly down on the earth. Just as suddenly they are born as hungry ghosts, or humans, or animals, or hell-dwellers, or asuras. Ah! There is no time at which it all begins, and no time when it ends. It is only when you realize the fruition and become a Buddha that you stop transmigrating in birth and death. Before you become a Buddha, you keep revolving in transmigration. It is said, "Even Bodhisattvas get confused after having gone through rebirth; even Arhats* become muddled after having dwelt in the womb." 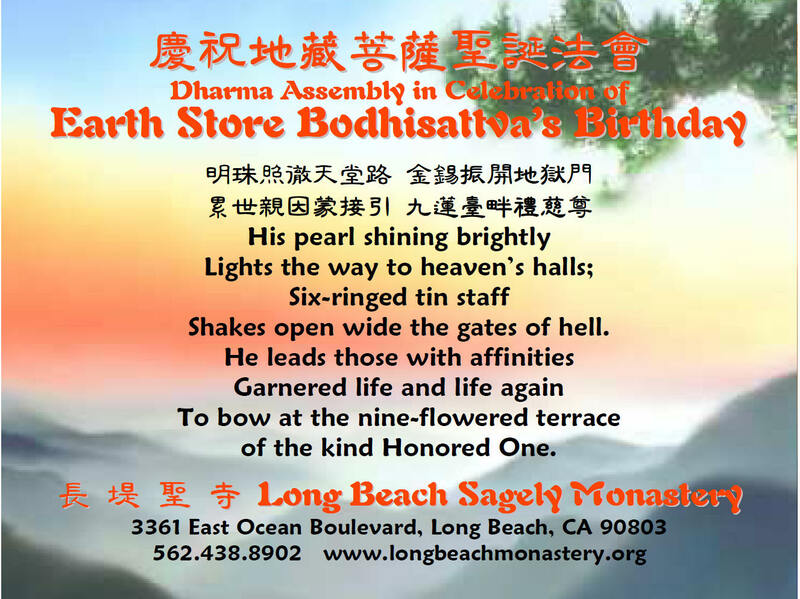 Even if you are a Great Knight of the Dharma body [a Bodhisattva] manifesting in this world, sometimes you may be confused by the current of birth and death and not know how to stop it. Our birth and death, being born and dying, dying and being born again, is birth and death on a great scale. We also have birth and death on a small scale. There is the day we are born. Although we are born, we will have to die. The day of our death is already set the day we are born. Therefore, our life is birth and death on a great scale. Each passing year brings the death of that year. Thus if we are born one day, we will have to die one day, because once there is birth, there is death. If there is no birth, then there is no death. 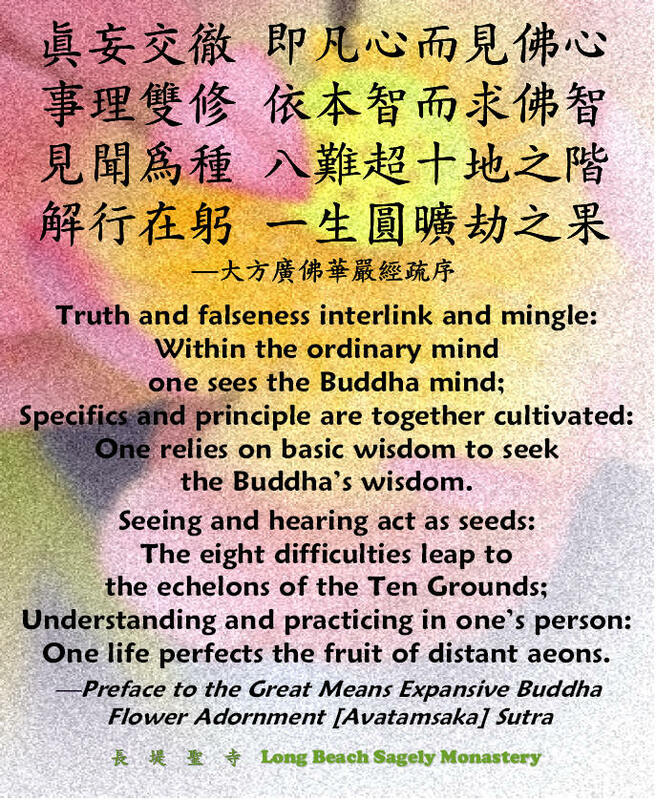 *Icchantika definition: An icchantika is one who has cut off all good roots, and it was considered impossible for such a person to realize Buddhahood. Icchantika is a Sanskrit word which is interpreted to mean “insufficient faith.” Icchantikas are those whose faith is deficient, and a deficiency of faith is the same as no faith at all. Icchantikas are also said to be those who have “burned up their good roots.” What is left once their good roots are burned up? Bad roots. 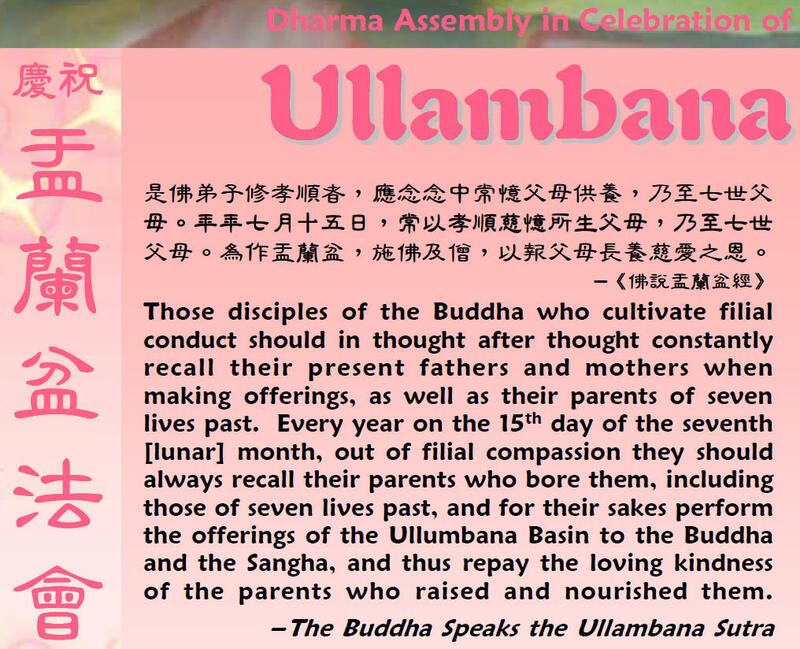 Therefore, the statement that icchantikas don’t become Buddhas was simply reproach and acclaim for the current time. It put icchantikas down with the intention of rousing them to repent and reform since they would think, “Oh, I’m an icchantika, with insufficient faith, so I can’t become a Buddha. Well then, I won’t be an icchantika anymore! I’ll start believing.” They change, and no longer are icchantikas. 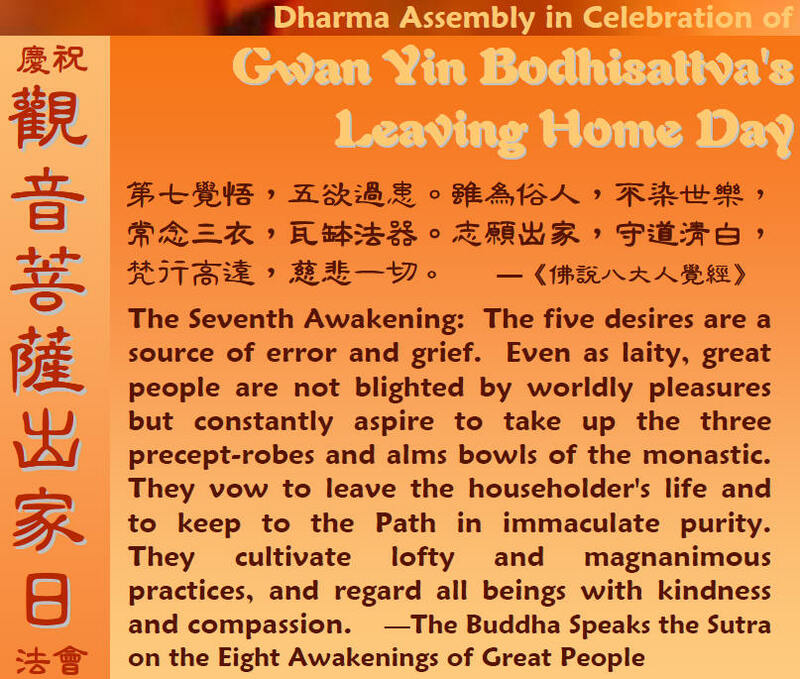 Or there are Bodhisattvas on the point of retreating from their Great Vehicle resolve. 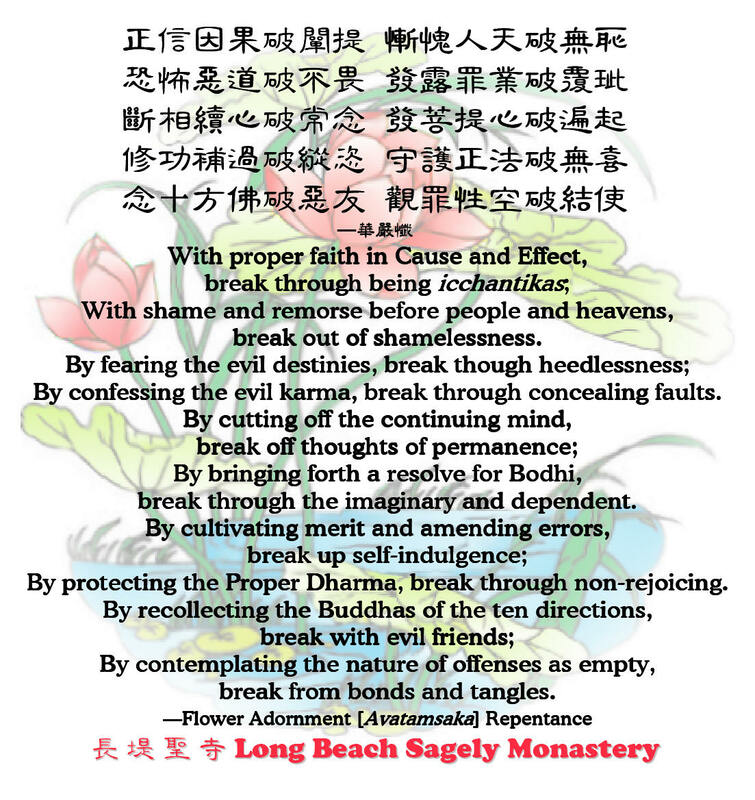 But as soon as they hear the Buddha say that living beings with insufficient faith, icchantikas, Fixed-Nature Sound Hearers, can’t become Buddhas, they don’t retreat from their resolve after all. 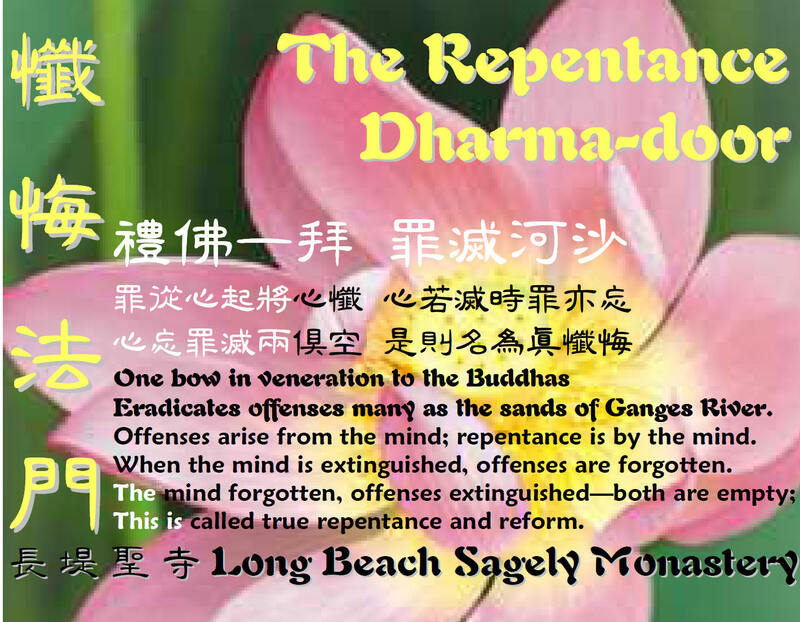 “Reproach” is causing the icchantikas themselves to repent and reform, and “acclaim” is getting the Bodhisattvas to keep bringing forth the Great Vehicle resolve for Bodhi [enlightenment] It’s the method of either commending them for being good, or censuring them for being wrong. The Sangharama is a still, pure place; in other words, any bodhimandala or temple. No one should be indulgent or unruly by engaging in sexual activity at any Sangharama, or any place where there is a Buddha image. 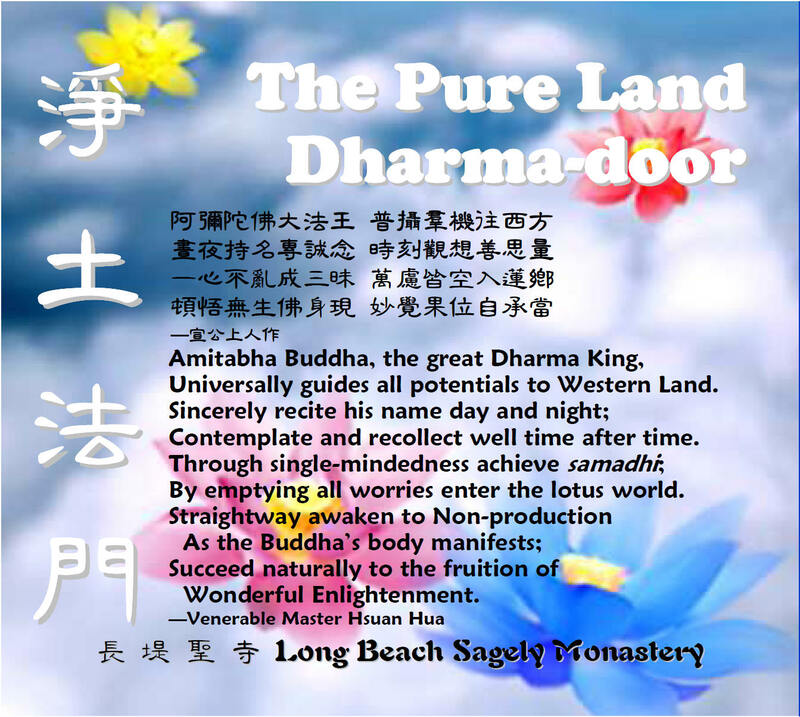 The Buddha knew it would be difficult for people to follow his teachings on their own, so he established the Three Refuges for them to rely on.... Buddhists take refuge in and rely on the Buddha, the Dharma, and the Sangha. These are known as the Triple Jewel. The Sangha are the monks and nuns. 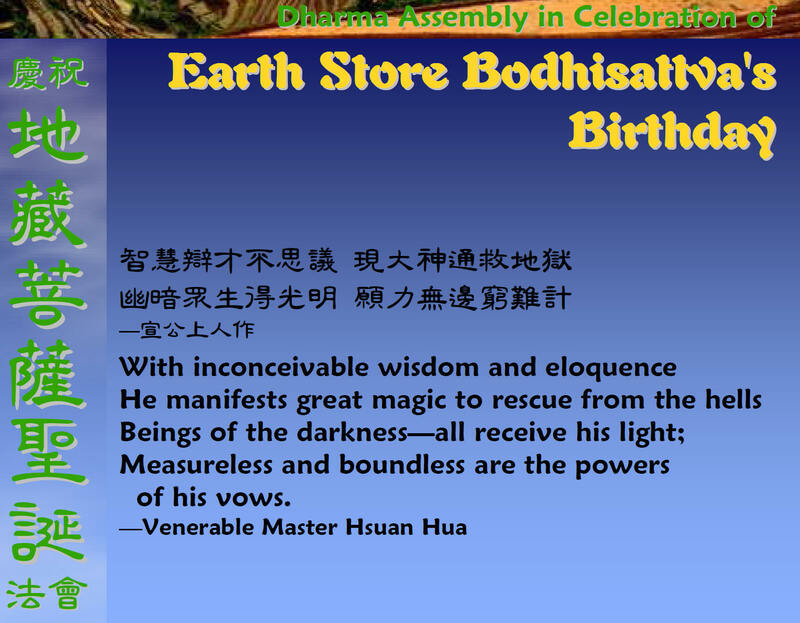 They live in monasteries and carry on the Buddha's teaching. 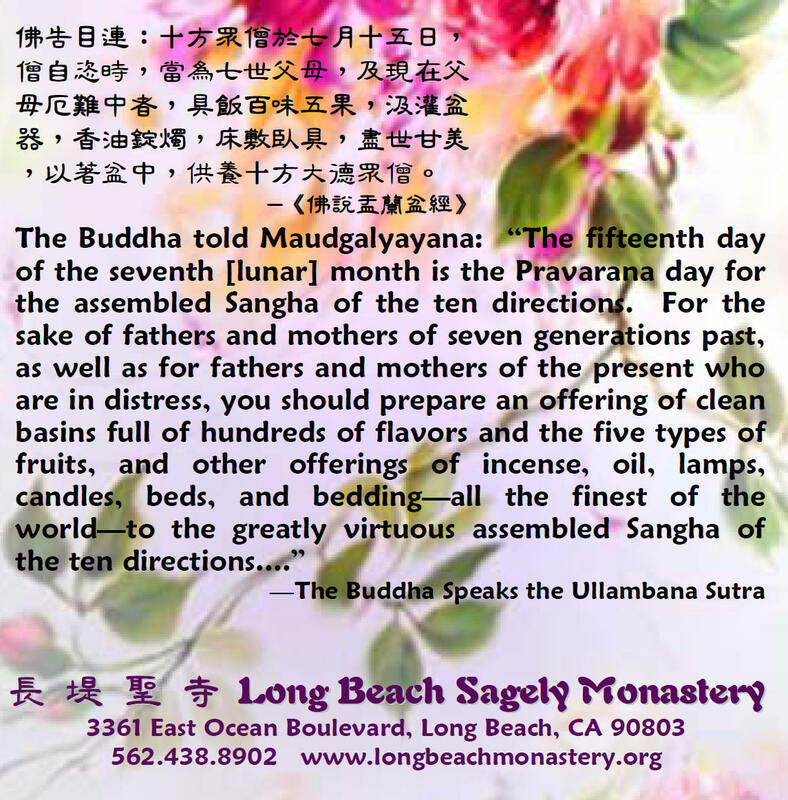 The word Sangha means 'harmonious community'. 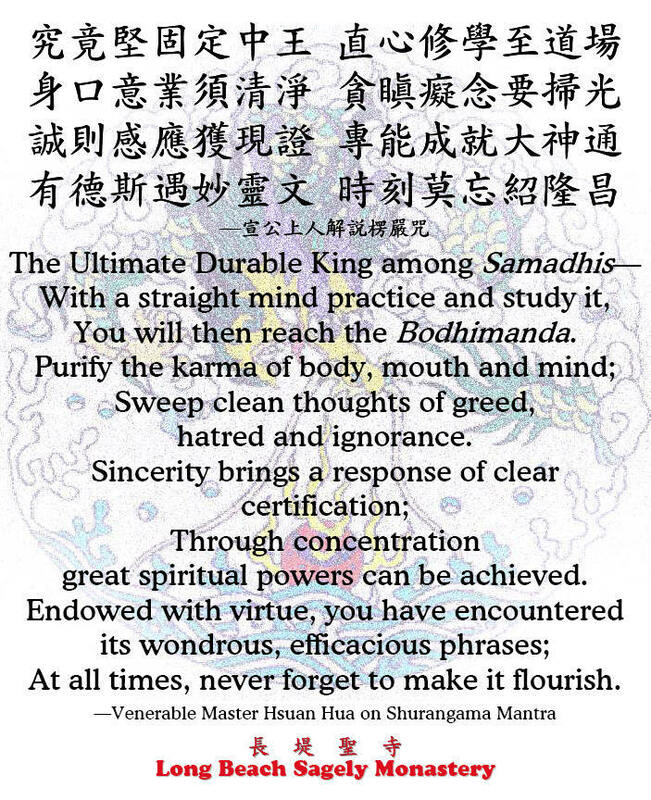 The Buddha, the Dharma, and the Sangha together possess qualities that are precious like jewels and can lead one to enlightenment. And to everyone equally brings joy. I will lead those who have lost their way to the right road. 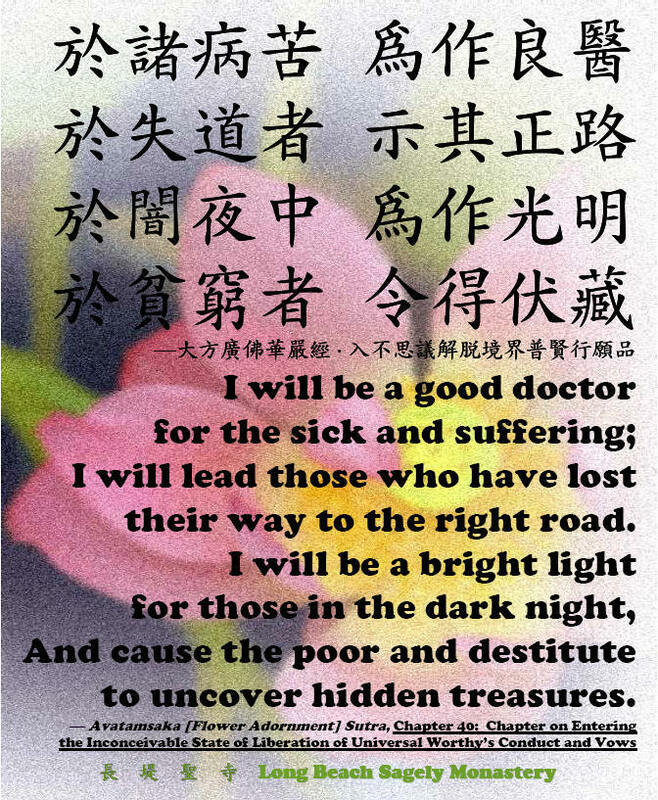 And cause the poor and destitute to uncover hidden treasures. Like the sun, transforming all in this land and yonder. For the welfare of every nation, instruct all people of the world. 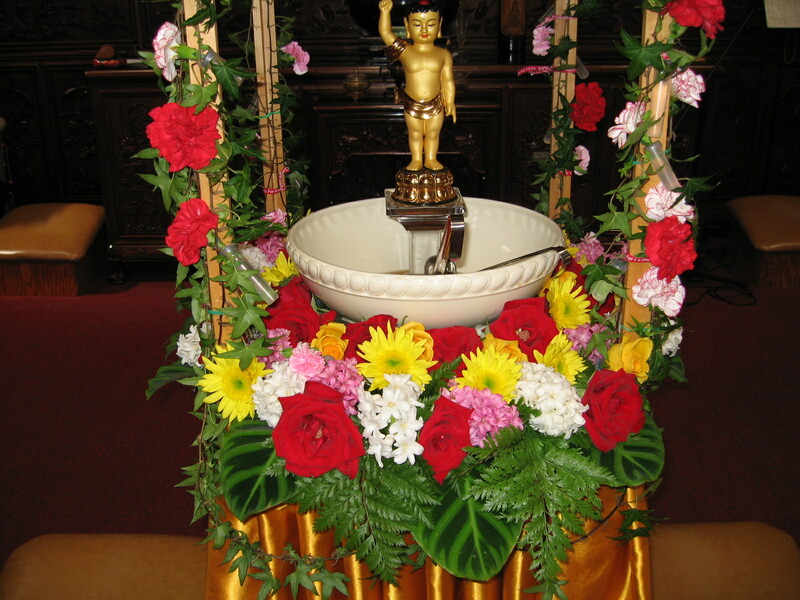 Those who venerate him obtain blessings and awaken to the Unproduced. 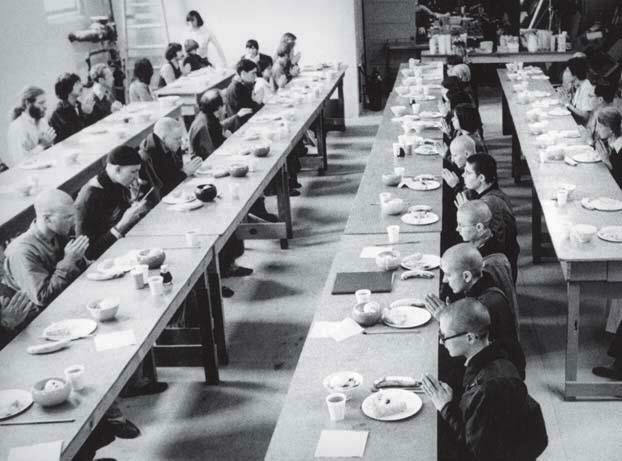 >> Vegan Buddhist Nuns Have Same Bone Density as Meat Eaters: a research study. Australian medical researchers found that although the 105 post-menopausal vegan (consuming no meat, no dairy, no eggs) Vietnamese Nuns in the study had 1/3 of the daily intake of calcium than the meat eaters, the vegan nuns' bone density was the same as the women who eat meat (animal protein) and diary. The researchers note that fruits and vegetables are likely to have positive effects on bone health. With every ounce of effort, there is a corresponding amount of harvest. When Earth Bodhisattva knows that you are reciting his name sincerely, he will eradicate your karmic obstacles. All of these are improper ways of supporting one’s life. 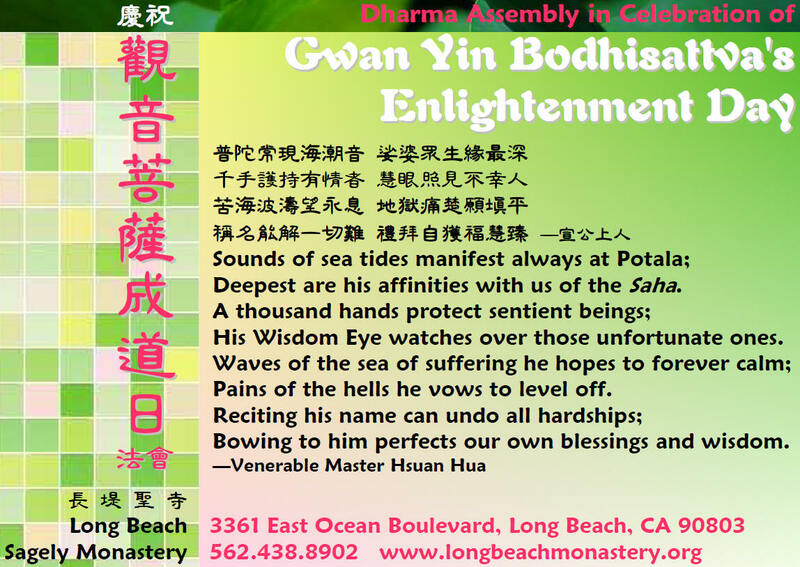 Q: What does it mean for Sangha members to be "pure fields of blessings"? To be pure is to have no defilement. To have no defilement is just how to not fight, not be greedy, not seek, not be selfish, not be self-benefiting, and not lie. The one who can keep the precept against holding money is truly a "pure fields of blessings" Sanghan. If, when you offer one some money, one gets all tickled pink, then that is a problem. If one can be "thus unmoving and clear with understanding", then when you make an offering, one is the same, and when you do not make offerings, one is still the same. True fields of blessings are devoid of all selfish desires. 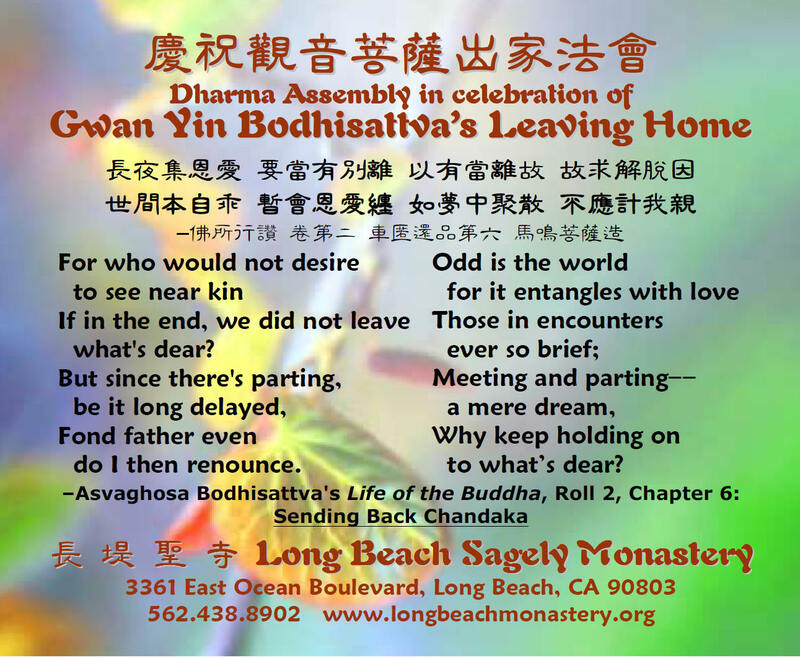 Don’t think that leaving home is an easy thing to do; it comes from a long history of planting for Bodhi. There may be those among the fourfold assembly of Bhikshus, Bhikshunis, Upasakhas and Upasikas, as well as other good men and women of pure faith, who accept and uphold the eight precepts either for one year or for three months, practicing and studying them. 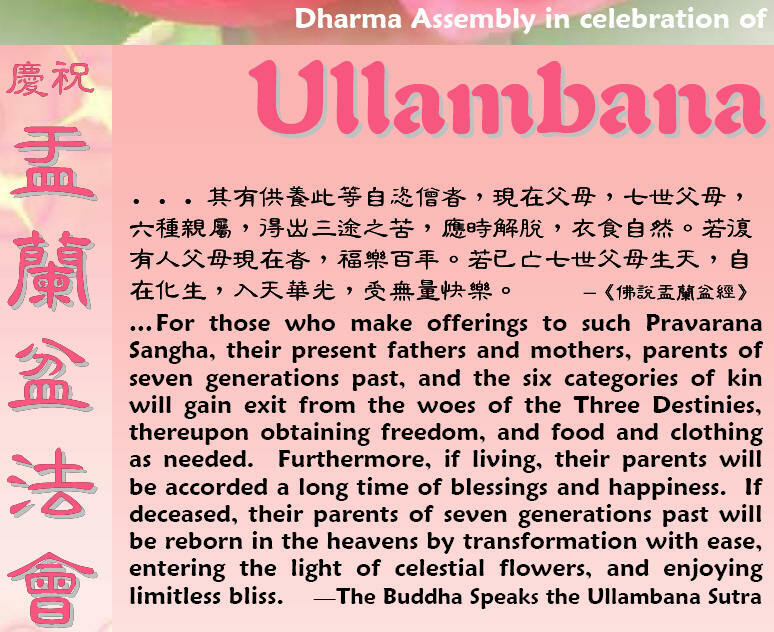 With these good roots, they may vow to be born in the Western Land of Ultimate Bliss where the Buddha of Limitless Life dwells, to hear the Proper Dharma, but their resolve may not be firm. 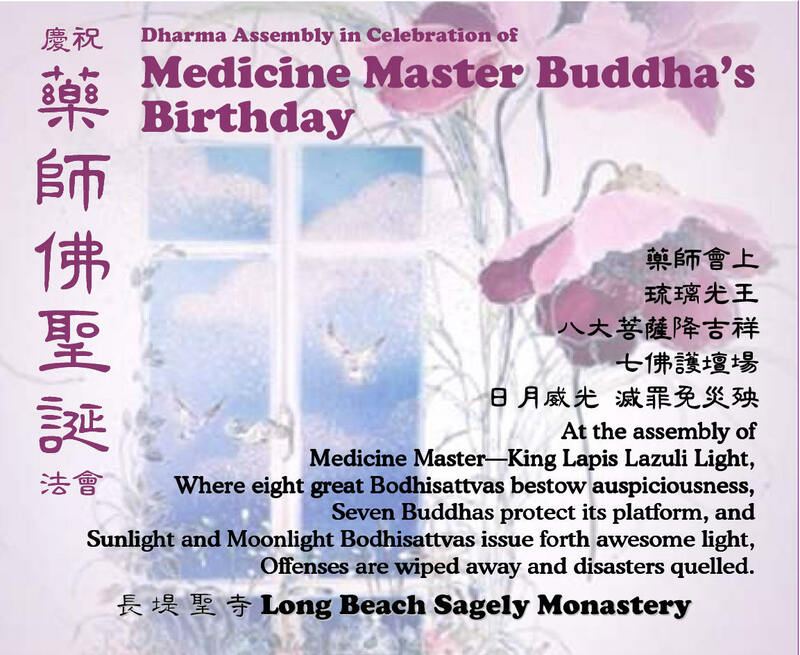 However, if they hear the name of the World Honored One, Medicine Master Vaidurya Light Tathagata, then as the end of their lives drew near, before them will appear eight great Bodhisattvas, whose names are: Manjusri Bodhisattva, the Bodhisattva Who Observes the Sounds of the World, Great Strength Bodhisattva, Inexhaustible Intention Bodhisattva, Jeweled Udumbara Flower Bodhisattva, Medicine King Bodhisattva, Medicine Superior Bodhisattva, and Maitreya Bodhisattva. 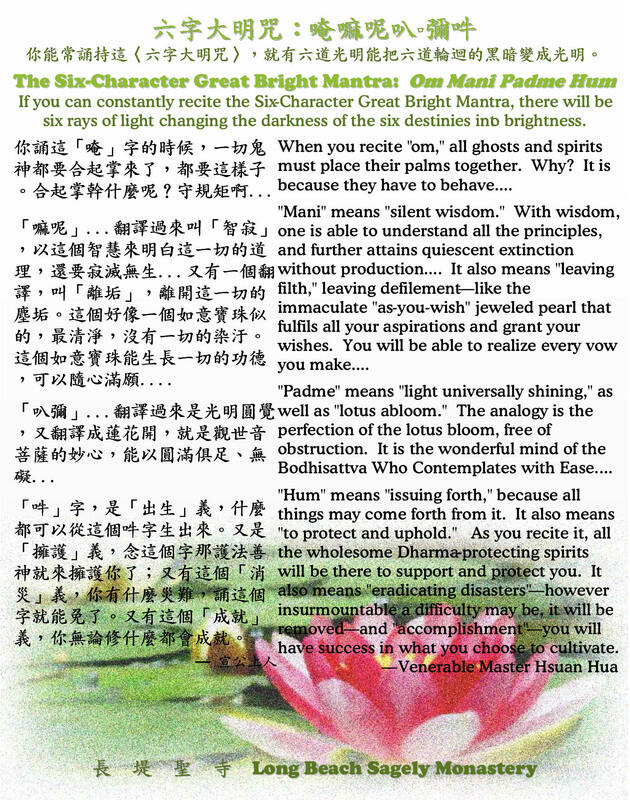 Those eight great Bodhisattvas will appear in space to show them the way, and they will naturally be born by transformation in that land, amid precious flowers of a myriad colors. 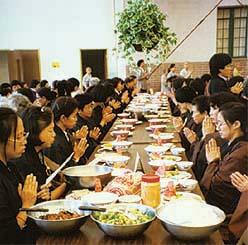 "At that time, the World Honored One entered a samadhi called 'Extinguishing the Suffering and Distress of All Beings.' 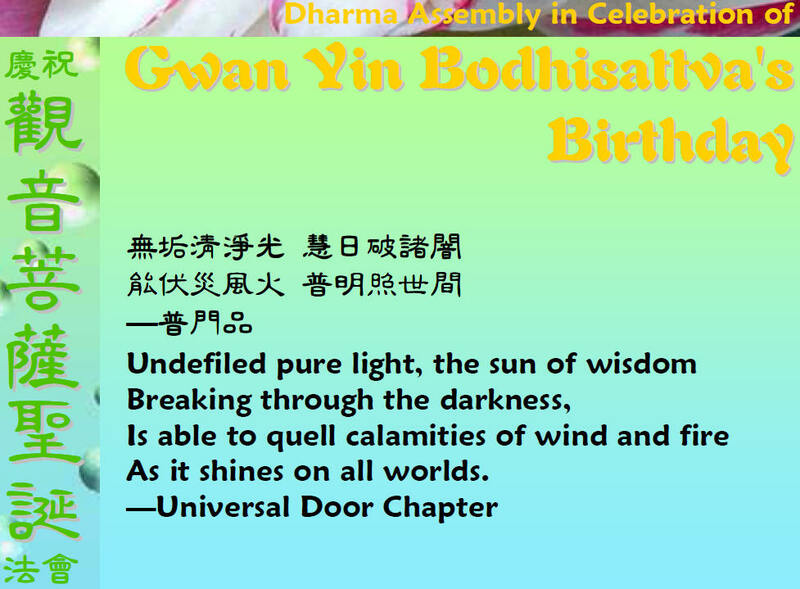 After he entered this samadhi, a great light came forth from his flesh-cowl. SAN MWO JYE DI SWO HE." 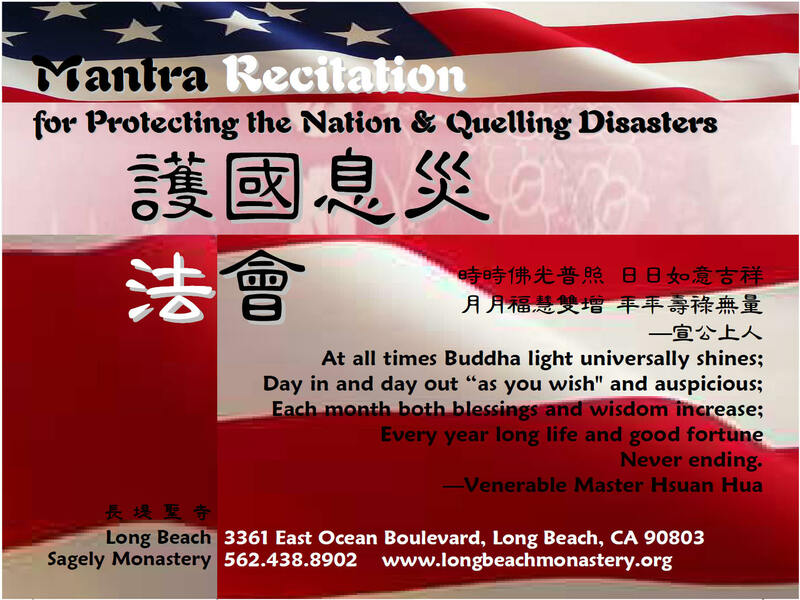 - If you wish to receive the Precepts (upholding the Precepts for 24 hours or longer), please call us in advance at 562.438.8902. 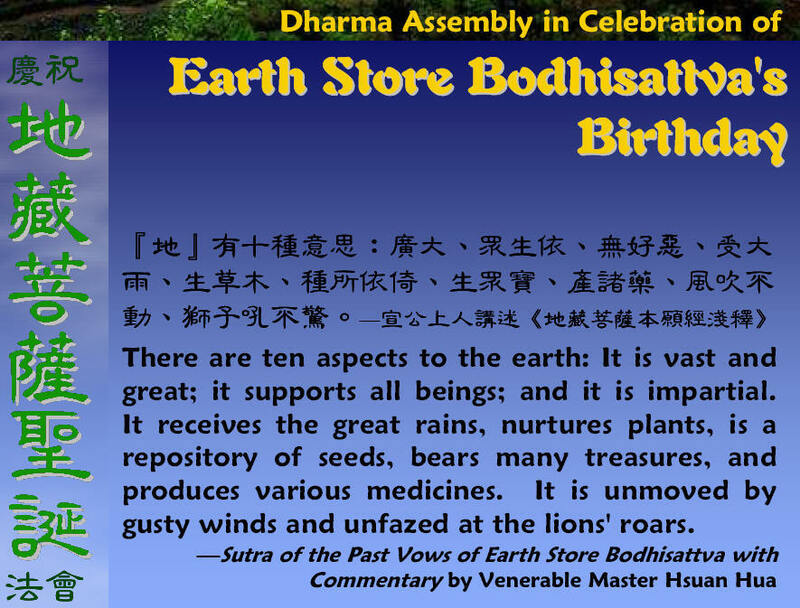 “Shariputra, those living beings who hear should vow, ‘I wish to be born in that country.’ And why? Those who thus attain are all superior and good people, all gathered together in one place. 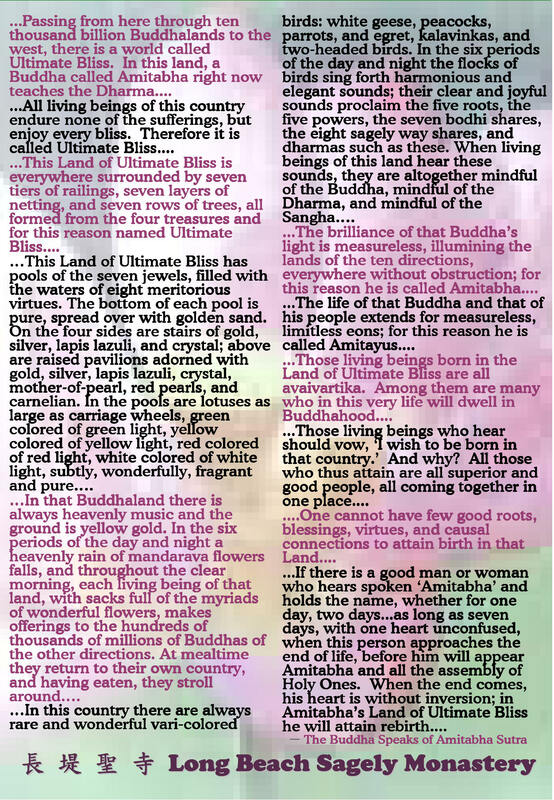 Shariputra, one cannot have few good roots, blessings, virtues, and causal connections to attain birth in that land. Although you may express the desire to be born in the Land of Ultimate Bliss, unless you have good roots, blessings, and virtuous conduct, you won’t be able to be reborn there. You must have cultivated all the Paramita doors for many lifetimes and in this way obtained great good roots, great blessings, and great virtue, in order to have the opportunity to meet this wonderful Dharma. Whether for one day. In Chinese, the word “whether” looks like this: ( 若 ruo ). 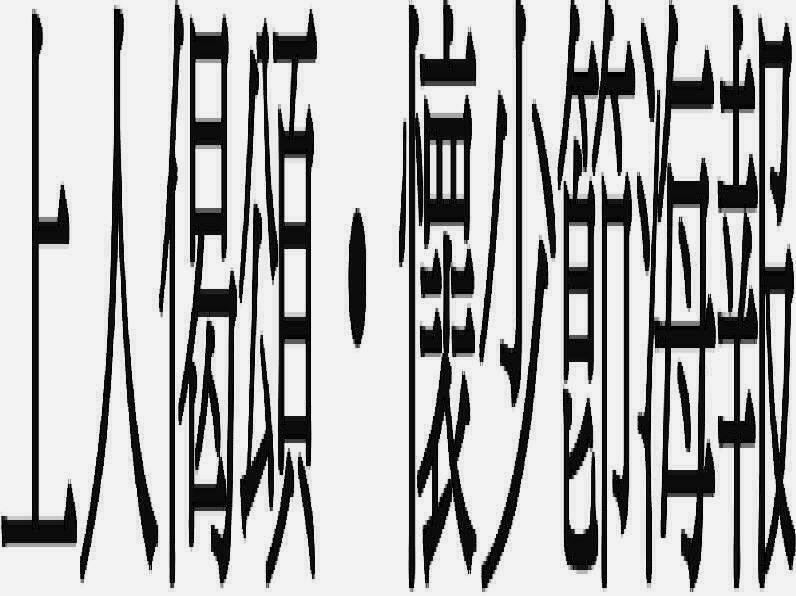 If you move the stroke in the middle, it changes into the word “suffering,” which looks like this: ( 苦 ku ). 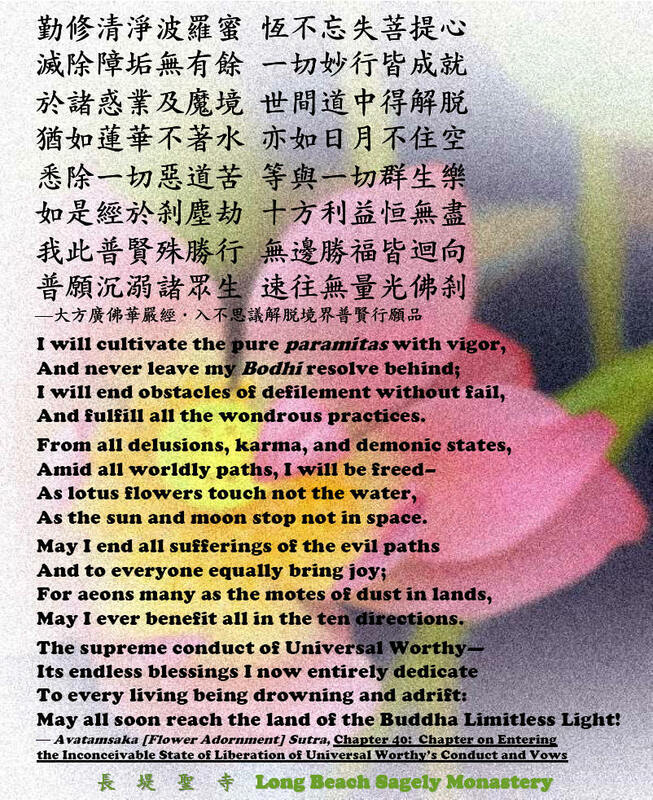 So you could say, “ suffering for one day, two days, three, four, five days, six days.” If you recite the Buddha’s name from four o’clock in the morning until ten at night for seven days, you can reach the level of one heart unconfused. 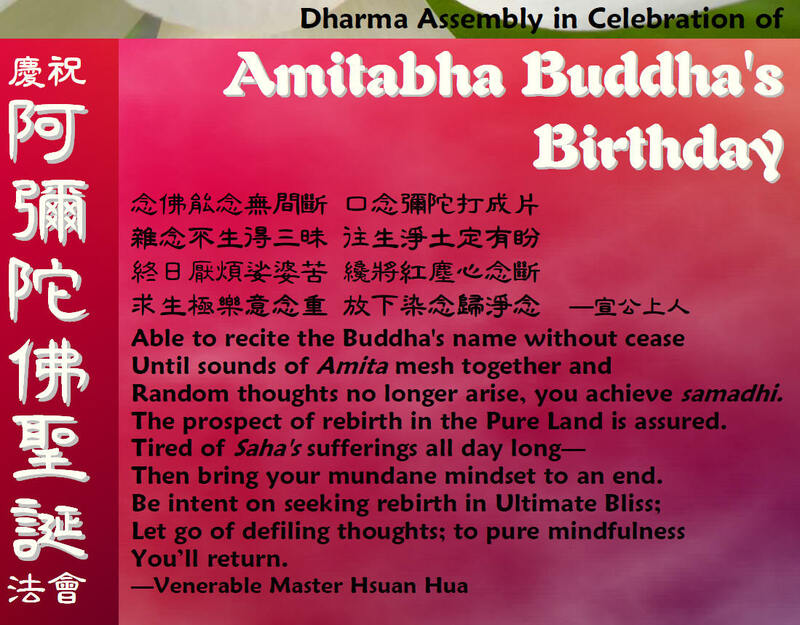 When your life is about to end, Amitabha Buddha thinks, “That living being suffered for seven days reciting my name, and so now I will guide him to the Land of Ultimate Bliss. 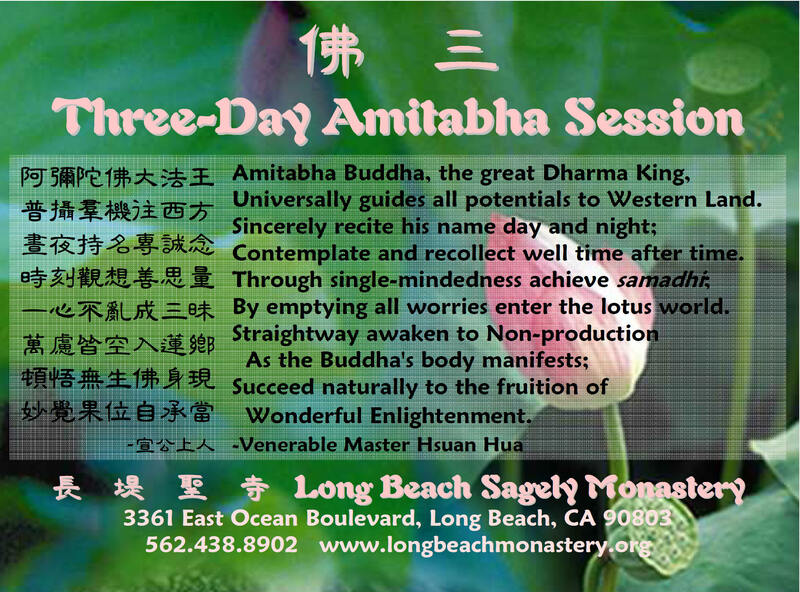 The time has come!” Then, Amitabha with Avalokitesvara Bodhisattva, Mahasthamaprapta Bodhisattva, and the entire clear, pure, ocean-wide assembly of Bodhisattvas appear before you, and lead you to the Land of Ultimate Bliss. If you think you can escape, you can’t. You are surrounded. At this time, your heart is without inversion . You won’t say, “I don’t want to go! 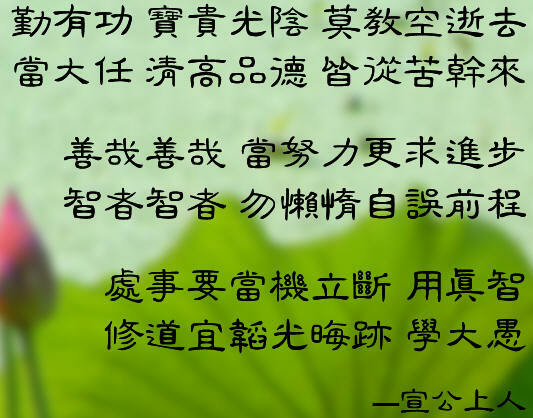 It’s too boring there!” It would never occur to you to refuse Amitabha’s invitation, and so you are born at once in the Western Land.